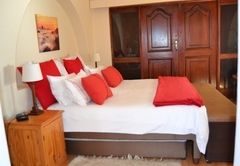 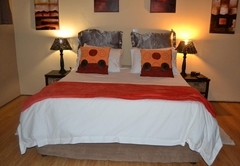 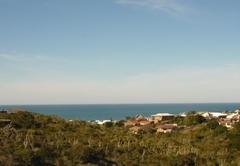 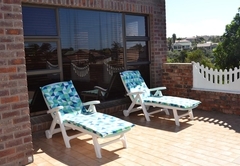 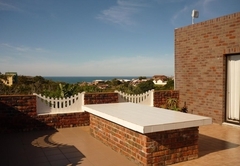 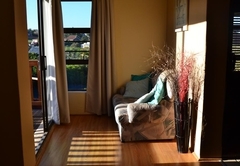 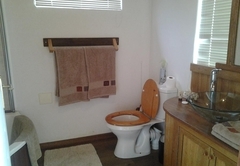 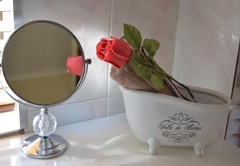 Dolphin View Guest House is a 3 star graded guest house offering Jeffreys Bay accommodation in 5 guest rooms. 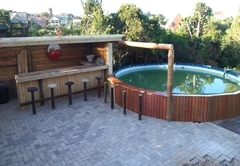 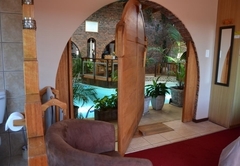 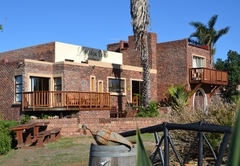 Dolphin View Guesthouse is located in the Noorse Kloof Nature Reserve in a peaceful, safe and quiet area not far from shops and the white sandy beaches. 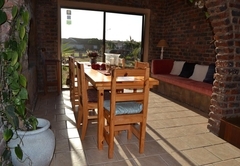 From the Guestrooms you have stunning views over the reserve and the ocean and you can enjoy the prolific bird life from your private balcony. 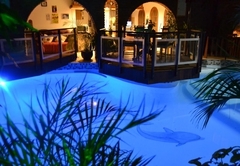 Dolphin View features an indoor pool, TV lounge, social area with fireplace, outside sunbathing area and beautiful gardens which are all lighted up in the evening. 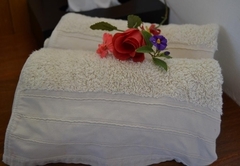 You can enjoy the indigenous plants and flowers while strolling through the peaceful garden, and totally relax your mind. 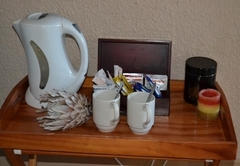 All rooms have heaters, fans, tea and coffee making facilities and all the needed toiletries. 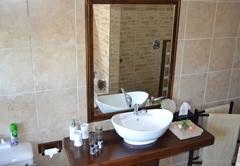 Bed and Breakfast room with double bed, en-suite bathroom with bath and shower, private balcony, private lounge, coffee and tea making facilities, heater, fan and television. 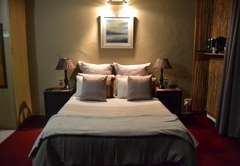 B&B room with queen size bed, en-suite bathroom with bath and shower, private balcony, coffee and tea making facilities, heater and fan. 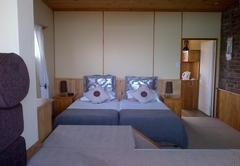 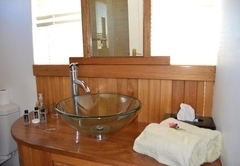 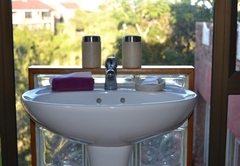 B&B room with double bed and open plan en-suite bathroom with shower, 2 large windows with great views over the garden, reserve and ocean, coffee and tea making facilities, heater and fan. 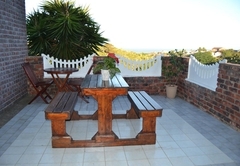 Bed and Breakfast room with twin beds and en-suite bathroom, 2 balcony's with view to the ocean and mountains, working desk for business people, coffee and tea making facilities, heater, fan and television. 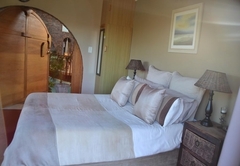 Bed and Breakfast or Self Catering room with queen bed and bunk bed and en-suite bathroom, private patio and entrance, small kitchenette, coffee and tea making facilities, heater and fan. 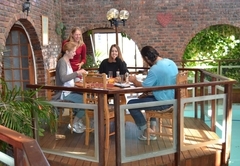 Dolphin View has an in-house tour operator where you can book and arrange all your tours, safaris and activities. 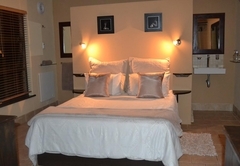 By example a tour to the Addo Elephant Park, Tsitsikamma, Shamwari and other attractions in the area. 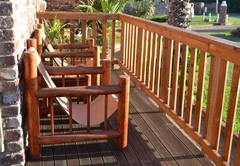 Activities available are sandboarding, surfing, mountain biking, kayaking, horse riding and more. 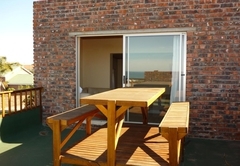 Please ask your hosts for any questions regarding tours and activities in and around Jeffrey's Bay. 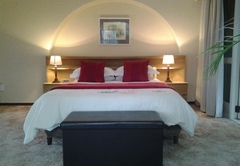 Also transfers from and to the airport can be arranged. 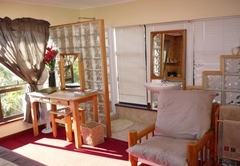 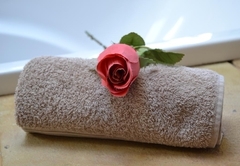 B&B room with en-suite bathroom, large balcony with stunning views, heater, fan and coffee/tea making facilities and the needed toiletries. 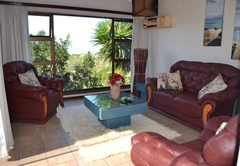 Response timeDolphin View Guest House typically responds to requests in 5-10 minutes.